Photograph depicts Abe and Rose Stern after going through immigration on their arrival at the Vancouver Airport from Odessa. Photograph depicts Abe and Rose Stern arrive at Vancouver Airport from Odessa. 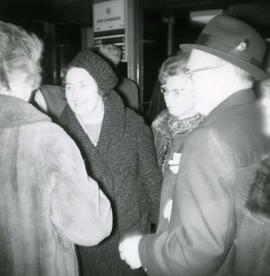 Photograph depicts Ben and Esther Dayson with Abe and Rose Stern at their arrival at the Vancouver Airport from Odessa. Colour Kodachrome 35mm slide depicts a long building with the word "CONSTANTA" in large letters on the roof, possibly the Mihail Kogalniceanu International Airport in Constanta. Photograph depicts the Vancouver Airport after the arrival of Abe and Rose Stern from Odessa. Abrasha Stern and Esther Dayson. 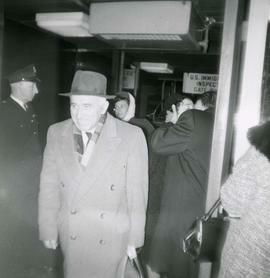 Photograph depicts a B'nai B'rith convention attendee exiting the Vancouver airport with his luggage. Photograph depicts a crowd of B'nai B'rith convention attendees gathered by the Vancouver airport. Colour Kodachrome 35mm slide depicts the Beograd (Belgrade) airport.